No you didn’t! Yes, I did! No, you didn’t. For Real, I did! I know! I’ve always been the one to say I’d never get one and here I am about to show you my new tattoo! Well somewhat new, I have kept it a secret for a year now. Surprise! I have worked in two careers where I have seen too many people naked. This led me to view quite a few tattoos. Young, old and in between. Most have not been delightful to stare at, especially when they are not artfully done or when the person’s skin is so saggy, I would have had to ask them to pull it tight to even recognize what the tattoo was portraying. Now I have always enjoyed photographing them as long as they did not embarrass me, they can create quite a dramatic effect when photographed well. Just like my very first presentation about our crash at St. James High School, it was GO BIG or GO HOME! Some of you may understand when I say that I ruined a perfectly good starch job only wearing this shirt for a photo shoot that I never left my home for. Then 500 trips back to the camera to see if all looked okay, my ankles said, "Good 'Nuff. " Yep, it’s big. I put more thought and research into this than I did my college classes. This is permanent and something I never thought I would do. So why did I do it? Our two daughters, who were in the crash with me, spoke of it a couple of years afterwards. That, when they were of age, they wanted to obtain something to acknowledge the evening that everything in their life changed and we came out the other side with a different, but positive perspective on life. As time moves forward and changes my body, so does my outlook on the tattoo. It becomes a symbol of faith, courage and determination. I am as proud to wear it as I am the scars that the metal of my car ripped across my body. It says I not only have survived, but I did not allow this experience to ruin me or my relationships. My open mouth gape turned upward into a smile and I asked, “So you are okay with this?” Not only was he okay he wanted to help in the design and encouraged me. the amount of strength I would need for my recovery, I thought the description fit and I am an improved person because of my journey, being reborn with this new life. 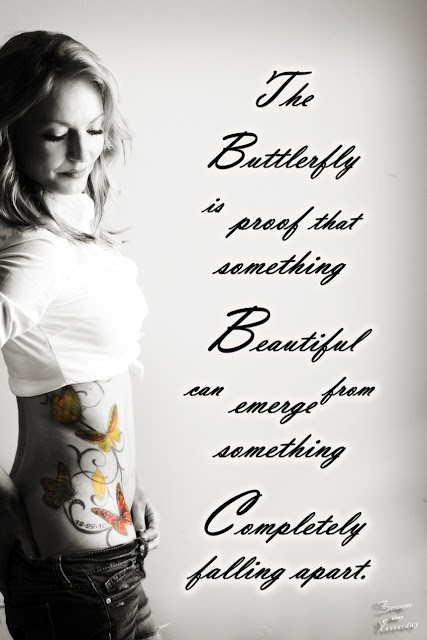 Butterflies are perfect. We decided on four because we have four children, each supporting our family as we traveled through four years of overcoming this tragedy together. Wanting the color to pop, just like my renewed outlook on life, I opted for bright, contrasted hues. Just like the butterfly, I am quiet in nature, but now subtly make my presence known. Not feeling too womanly with my scars and awkward walk, I wanted this to show strength combined with femininity. Ten hours of adding butterflies, scrolls and lastly the date, my artist, Will at Blood Brothers Ink , suggested the cocoon. Listening to my story and how it has affected me, he also viewed this as a re-birth. I was wrapped in a cocoon for four years as I recovered and emerged a beautifully scarred butterfly, who has a wonderfully positive view on just about everything in her life. *** My artist Will Spencer is wildly creative, listens to your ideas and is equally creative and trustworthy wielding needles and ink. My personal recommendation.